Within months of the onset of Prohibition on January 16, 1920, organized crime had set up floating liquor markets, or "Rum Rows," all the way down the Atlantic coast and along the Gulf of Mexico. Flotillas of rumrunners rode the swells just beyond the three-mile limit, where they were safe from Coast Guard interference, and awaited the arrival of small speedboats belonging to bootleggers who figured they could load up with booze and outrace a government cutter to shore. Eventually these fleets stood off Boston, New York, Norfolk, Savannah, Tampa, Mobile, New Orleans and Galveston, but the most important Rum Row stretched from Maine down to New Jersey. European goods, especially Scotch, were unloaded here, as well as huge quantities of liquor from Canada. Easily the most famous rumrunner of the day was the founder of the New England/Mid-Atlantic Rum Row, Captain William McCoy, whose goods were always first-rate and unadulterated—thus both he and his contraband liquor became known as "The Real McCoy." McCoy preferred serving the New York area because that was where the money was. One of his prime customers was Joe Adonis, who handled the imports for the Broadway Mob headed by himself, Lucky Luciano, Frank Costello and Meyer Lansky. The Broadway Mob supplied good whiskey to all the speakeasies in Manhattan, and while it was common for some importers to duel with the government gunboats known as rumchasers, the Adonis fleet seemed for some reason to have less trouble than others. Part of this good fortune appears attributable to Frank Costello who was already functioning as a fixer for the mob. 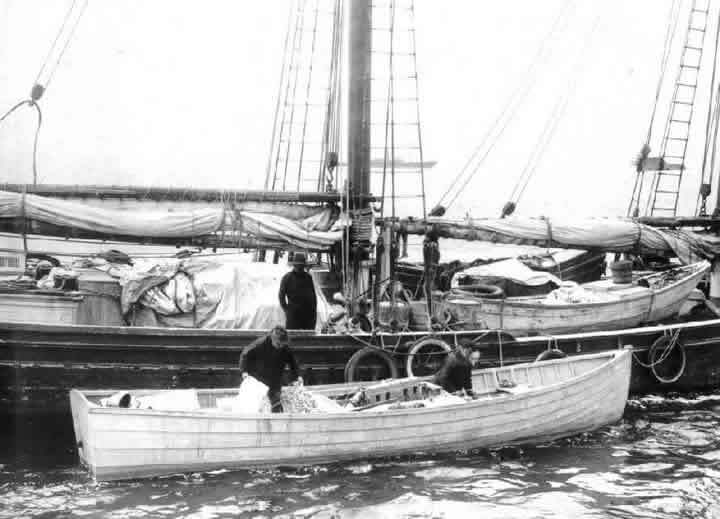 Rum Rows, which included every type of vessel afloat from old fishing boats to luxury cruisers and yachts, remained an embarrassment to law enforcement for the life of Prohibition, strikingly visible confirmation that Prohibition was too profitable and served too many customers to ever be enforceable.